Schroff CompactPCI hybrid system, available from Dedicated Systems Australia , is a combination of CompactPCI and CompactPCI Plus. CompactPCI Plus is the successor to CompactPCI and the PICMG 2.30 CPLUS I/O specification allows a soft migration path from CompactPCI to the future of serial protocols. Both specifications, each still at the draft stage, represent the logical development of CompactPCI, supported by data transport mechanisms, PCI Express (PCIe), SATA, USB II & III and Ethernet BASE-T.
Schroff have now developed a system, including backplane that can be used as a hybrid for both CompactPCI and CompactPCI Plus. As many applications boards are still based on CompactPCI, new developments in future will assume, CompactPCI Plus, the possibility of mixing the two standards in one system is of considerable benefit. Mechanical construction of the hybrid system is similar to that of the new 8-slot CompactPCI 3+1 system from Schroff with integrated 1U fan drawer. 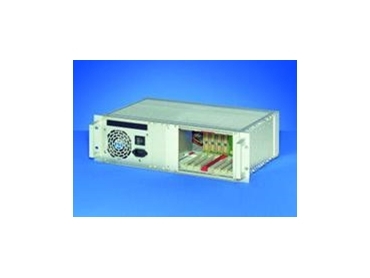 Power is provided by a 19 inch PSU with an output capacity of 250W and rear IEC mains input. The hybrid backplane provides conventional CompactPCI slots on the left and CompactPCI Plus slots on the right. The PICMG 2.30 CPLUS I/O slot positioned in the centre joins the two worlds together. In contrast to CompactPCI, the peripheral CompactPCI Plus slots need only a relatively small, low-cost connector with six contact rows. It carries power, high-speed signals and, where used, monitoring and control lines. The system, based on the PICMG 2.30 CPLUS I/O, can support up to 7 parallel peripheral slots as previously, and up to 4 serial peripheral CompactPCI Plus slots. The restriction to 4 slots results from the number of contacts available in the P2 connector. However, the number of slots can also be increased if required.